What’s your reaction when you see fake plantation-style columns in front of a fairly modest home, or a circular driveway in front of a house on a quarter acre lot? Do a bit of eye-rolling, perhaps? 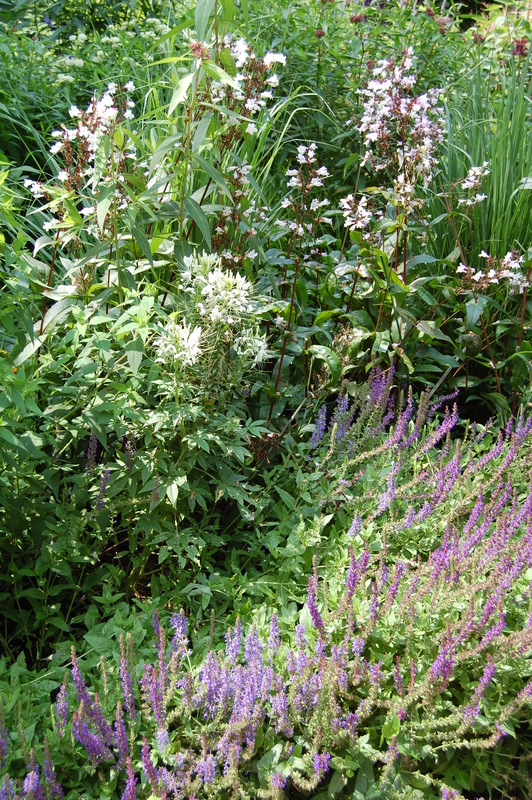 Then I must tell you that when I saw the grand sweep of Salvia (known as the River of Salvia) at Chicago’s Lurie garden, I was seized by the absurd desire to imitate this vision. 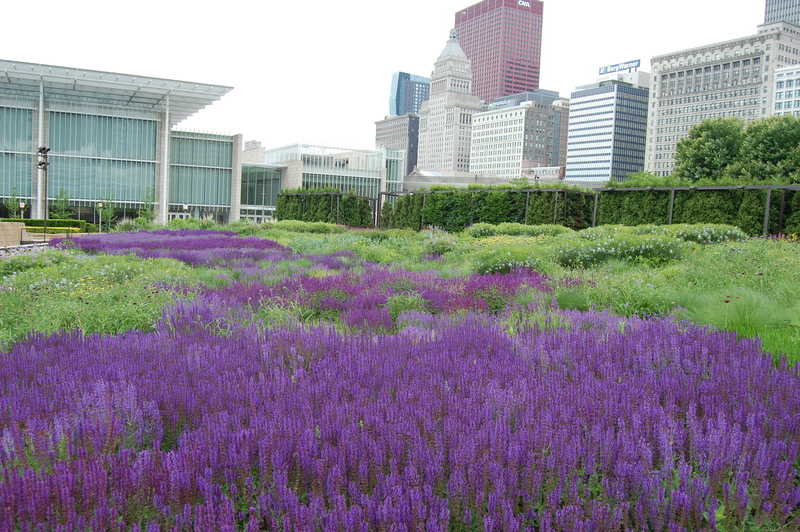 Lurie Garden’s River of Salvia. Absurd because I garden on a slightly larger than average city lot. What I did was pull out the Wild Geranium (G. maculatum) that grew in a roughly 3’x8′ sweep along my sidewalk border, and replace it with a mix of Salvia xsylvestris ‘Blue Hill’ and ‘May Night’. This was last spring, and the first summer it looked like this. I like to refer to it as my Puddle of Salvia. My Puddle of Salvia, 2012. I knew I needed some perennials planted behind the Salvias, and settled on Penstemon digitalis ‘Husker Red’. These really came into their own this year, making this part of the border look like this. This makes for a nice contrast I think, in habit and foliage color, as well as flower shape and color. However, no one would mistake it for Lurie’s River of Salvia. So is this the horticultural equivalent of fake plantation columns on a Chicago bungalow? I don’t think so. We can be inspired by an element of a garden far grander than our own, then translate that inspiration into something beautiful, genuine, and appropriate to place. 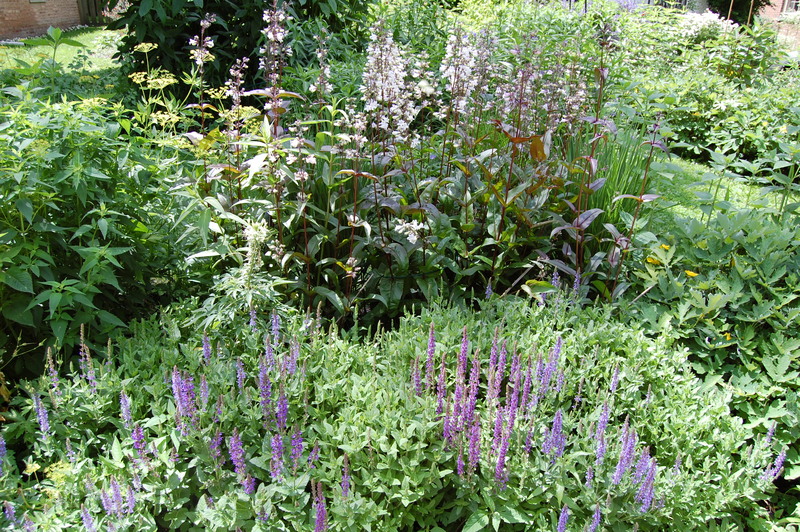 In this case, a much smaller mass of Salvia is still beautiful in a city lot garden, especially if it is integrated into the whole and the scale is proportional. One practical matter I should mention, though. I’ve been bothered the tendency ‘May Night’ has (and ‘Blue Hill’ as well, to a lesser extent) to sprawl and open up in the middle. It happened last year and as a result I cut back both Salvias in early May – but they sprawled again anyway. I’ve resorted to placing 9″ sticks in an X formation along the sidewalk to prop the plants up. This has worked OK without being visible. 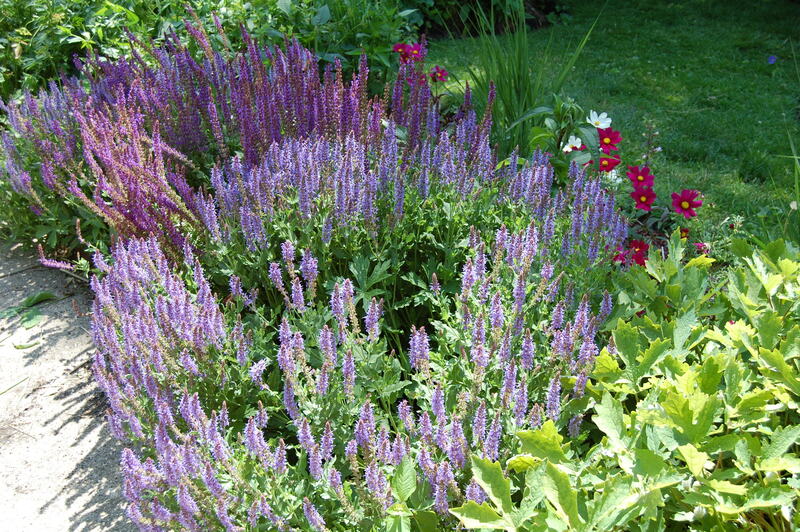 To echo the Puddle of Salvia, I’ve put clumps of Salvia in some other beds near the sidewalk. 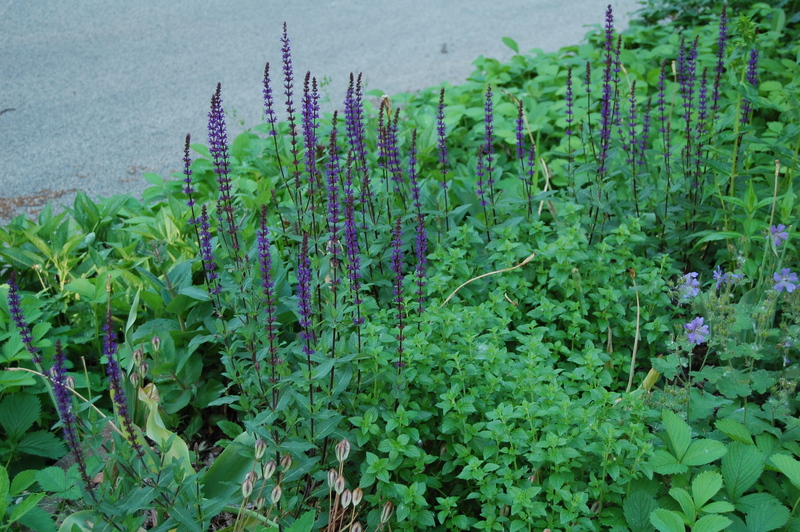 However, I am using mostly Salvia nemerosa ‘Caradonna’, which is purple but also seems more upright. Have you ever tried to translate something you saw at a famous garden in your own, successfully or not? I have tried to imitate the beautiful wildflower meadows on Mt. Rainier in a small wooded area of my garden. Not particularly successfully, yet. But I’m still working on it. I think your puddle is lovely. Thank you. A puddle is better than a mud hole. It looks beautiful! You did well 🙂 Yes, I would say I have been inspired by certain garden styles. Maybe not so specifically as you have but more generally tried to imitate a feel. I think most of us have, one way or another. Even if on a smaller scale it turns into a different thing. Sorry. Your rivulet of salvia in no way calls forth the Lurie for me. Fountains in the front yard also feel pretentious to me. OK, Rachelle, stop waffling! Just tell us what you think! I think you ‘ve done well with your puddle. I’m jealous–my ‘May night’ is not a deep blue like I want. And I just have a splash of salvia–working my way up to a puddle! Pinning down the colors of Salvias is always a challenge I find – they seem to shift among undefinable shades of light or dark blue, purple, etc. They never look exactly as you expect. Very true! It’s like a big buffet with just your one favorite food. I’m doing the ‘river of’ with formal lines, and drifting sweeps of succulents on our Karoo Koppie. I ❤ the Lurie Gardens. On my bucket list. Thanks. Now I have to go look up Karoo Koppie. I think we are always consciously or unconsciously influenced by what other gardeners do. It probably doesn’t work if we copy exactly, we always need to adapt to our specific context. I love the idea of a purple rivulet, never seen it before. I think your sidewalk border looks beautiful. You’re right, I think imitation on its own is not a negative. It’s what you imitate, and how you adapt it, that counts. I like plants that grow in drifts like those found in nature, so I used to try to get that look in my plantings. It isn’t as easy to do as it sounds. It looks like you’ve pulled it off with your salvia though. Thanks! The ease of drifts probably depends on the plants. Salvias are relatively easy to work with, I think. I’d say you’ve mastered the translation! My challenge is taking a big idea and making it smaller. I am not always successful at providing the same impact! I know what you mean, I’ve had my share of mistranslations. I share the urge to replicate a botanical garden installation in a small suburban plot — I try to do it all the time, with frustrating results. Your puddle of salvia looks great, even if it isn’t Lurie-sized. May Night and Husker’s Red are two of my favorites and I have them together in a bunch of clumps in a small garden — I’m glad to see how you’ve used them here. Seems we have a lot of the same plants as favorites. Ah a gardener after my own heart…our gardens are smaller then our eyes think…. Maybe I need sticks for my Monardia. Floppy loose tippy drunken monardia. I definitely stake my Monarda – well, it’s more like letting them lean on bamboo stakes set in the ground in Xs. My Monarda gets pretty big, so I need decent size stakes. Hah! I constantly try to imitate what I see in my own garden, I’m rarely as successful but it keeps things from getting stagnant…. And every now and then it works out to be something new and all my own! For the floppy salvias I sometimes surround them with butterfly bush trimmings in early spring. They grow over and hide the twiggyness within a couple weeks but it’s enough support to keep them up. That idea with the buddleia trimmings is a good one! Yup, but it started with a photograph of Dalmation Bellflower cascading over a wall at Stonecrop Gardens, in Cold Spring New York, rather than an actual visit. Same impulse though. Search for Dalmation Bellflower on my blog (or use the index) to see what I mean. That sounds nice … I’d like a place to do that! Wait, did I tell you about my imaginary conversations with Piet? I love Salvia and the insects do as well. That is the best reason for mass planting I think. While inspirational, the grand application at Lurie Garden is one to be admired. It is the same with the red poppies one sees in fields. It can not be matched on a small scale, but gives one the inspiration needed to do more than a small planting. Many folks rarely do more than single plantings of certain plants but seeing them in numbers can change minds for their own landscapes. I like the visual impact of a big planting, the only problem is it means you can;t have as many different kinds. I like your puddle. My salvias sprawl too. I figured it was becasue I don’t have full sun where they are located. Is yours in full sun? I also like the contrast of the huskers in the back. Nice planting. Full sun or pretty close to it. I was also wondering if it was because the soil was too rich. I think Salvias like a lean soil. Most people get their divine inspiration by looking at other gardens and nature, I think you did a great job with your plantings. Living in suburbia myself I know how hard it is to create something on a smaller scale. Occasionally I consider seizing part of the neighbor’s yard. Delusions of grandeur is what gets most of us through the day. Remember, one man’s puddle is another man’s sea. As for follies, I actually tried to replicate Daffodil Hill from the Brooklyn Botanic Garden. The less said about that, the better. Sometimes you want to maintain plausible deniability. Your choices are just right. 😉 Seriously, first of all, you are happy with the Salvia as you have it, and second, waves of Salvia–no matter where they are–are classy, lovely, and heavenly. (Can you tell I like Salvia?) Oh, and the pollinators love it! It’s perhaps the best early (and continuous, with deadheading) companion plant I have in my potager garden. Early in the summer the bees were going crazy over it, and soon after the Tomatoes and Cucumbers started to appear and bolt! Apparently, the monarch butterflies like it, too, although I haven’t seen many in my garden this year. I like Salvia too. It is really one of those basic building blocks of a perennial border. Beautiful indeed Jason! Your translation is absolutely wonderful! I love how you paired the salvia with the penstemon! I have “dark towers” in the front and salvia in the back but you have inspired me to pair them together! I haven’t tried ‘Dark Towers’ I hear it is very floriferous. Jason, I love your idea of puddle of Penstemon and Salvia, nice combination! Sometimes it’s warranted to plant the flower mass on the borders. Thanks, Nadezda, glad you like the combination. It’s a nice purple puddle! Yes, I’ve tried to imitate bits of gardens I’ve admired, with varied success–most notably this year with my Lantana and Gomphrena patch, inspired by the Penn State botanic gardens. I think we all dream of unlimited space and a staff to help us keep up with it all! Lantana and Gomphrena – now that sounds really interesting. I like your puddle of salvia. It doesn’t have to look like the river that inspired it. I shamelessly steal other people’s ideas – they rarely look the same except in my mind! Very true, I’m probably the only person who makes the connection to the source of the idea. Hello Jason, that salvia planted en masse like that does look amazing. In my tiny garden it’s difficult to take anything of even normal size and squeeze it down into something that would fit, so I’ve ended up with my own take on things, which is more akin to doing a jigsaw puzzle. You keep putting more and more plants in and when you spot gaps, look for plants that will “fit” and put them in. Rinse and repeat. I like the metaphor of the garden as jigsaw puzzle. Apt and clever. Do other Salvias do better than Caradonna? Hi Jason, I’m glad you’ve been asking such question to yourself, as I didin the past too with my garden. I took a lot of ideas, in particular from Oudolf’s projects indeed, and translated them into an inspired translation-interpretation of the original. I think the very important thing is always taking account of where we took inspiration from and never ever assuming we did the same thing as the original. Doing so, I guess even the original designer would be glad to know that other people are taking inspiration from his works: it means his message has been passed through. I think that’s right. It just takes experience to develop that sense of proportion. Gardenerers have so many good qualities. A sense of proportion would be one of them, unlike the McMansion builders. Don’t talk about McMansions! At least that trend seems to have halted for the time being. I love that you reinterpreted this is your garden. And I think it’s successful!